Lymo Construction Co., Inc., Merrimack, N.H. 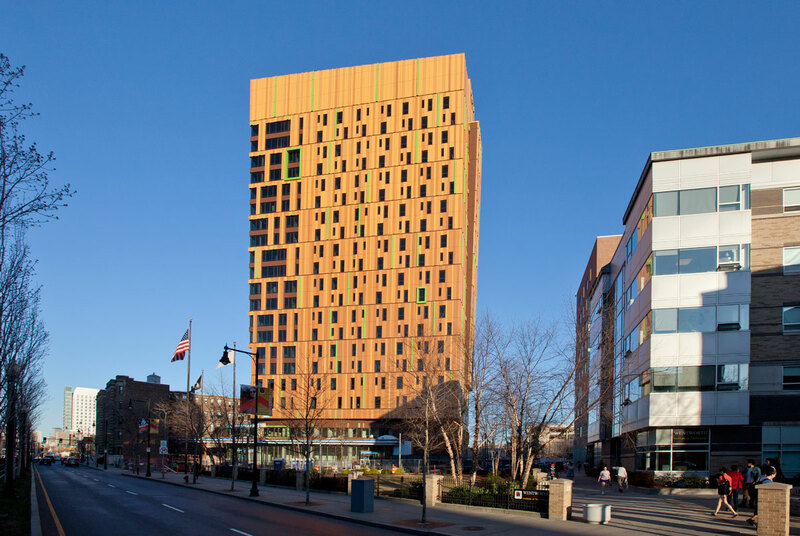 The practical goal of the new $61-million 21-story Student Residence Hall at Massachusetts College of Art and Design (MassArt) in Boston may have been to provide 145,600 square feet of on-campus accommodations for 493 students when it opens in the fall of 2012. 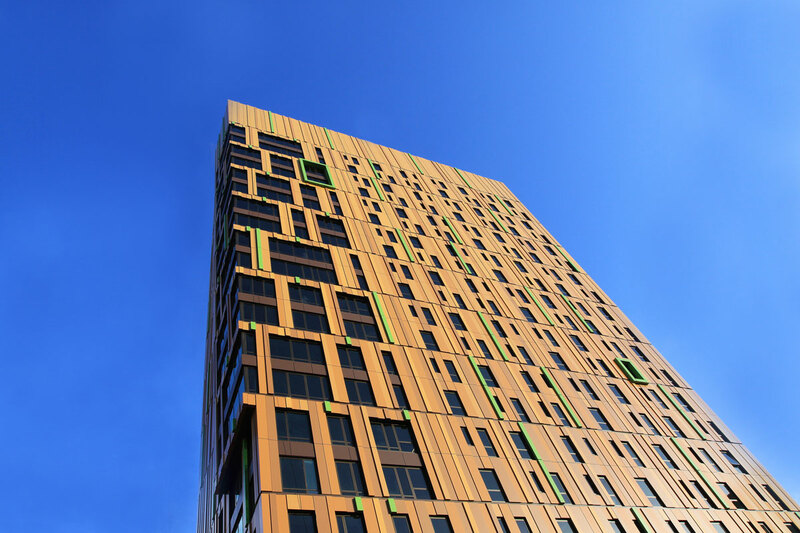 But the unique design of the new Residence Hall – which is clad in 5,500 Alucobond® Plus aluminum composite panels in seven custom colors that are dimensionally positioned with glass to invoke Gustav Klimt’s 1909 “Tree of Life” painting – has met an aesthetic goal to set the building apart on the Boston skyline and, thereby, create an idiosyncratic image for MassArt. An 80-person design charrette – consisting of MassArt administrators, students, faculty members, trustees and alumni as well as representatives of building owner Massachusetts State College Building Authority – met with architects from Boston-based ADD, Inc., to collaborate on the design of the building, which features 136 suites configured with single, double and triple bedrooms. Public areas include workrooms, a café, a student health center and a “pajama floor” outfitted with a game room, TV lounge, group study area, laundry, fitness room, vending area and a community kitchen. The new Residence Hall will allow the college to increase housing of its student population from 26 percent to 44 percent. 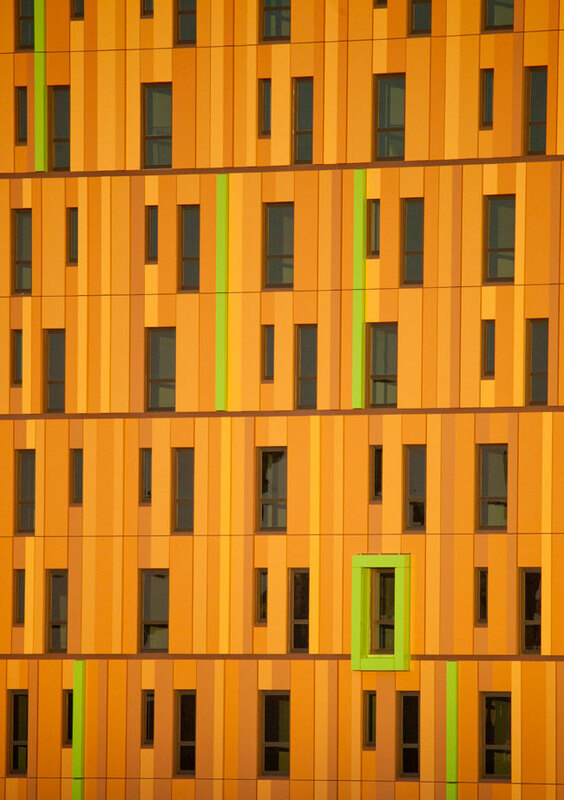 Boley’s team suggested Klimt’s “Tree of Life” painting as a point of departure and inspiration for the building that would embody the rebirth of MassArt. “The ‘tree of life’ is represented in almost every culture and art form in the world; it conveys a meaning of change and optimism,” said Boley. Boley describes the work of famed Viennese artist Klimt – whose 150th birthday would be celebrated July 14, 2012 – as “somewhat pointillist” with the artist “always contrasting one color next to the other, providing richness at different scales of perception,” he said. To recreate the “Tree of Life” image, a total of 174,768 square feet of Alucobond® Plus material in the 4mm thickness was ordered in seven custom colors, which also were differentiated with five gloss levels ranging from 10 to 50. In addition to offering a wide range of stocked colors, Alucobond is known for its extensive custom color-matching program. Working with PPG Industries, 3A Composites’ custom color specialists provided 54 color matches to create these panels for MassArt. 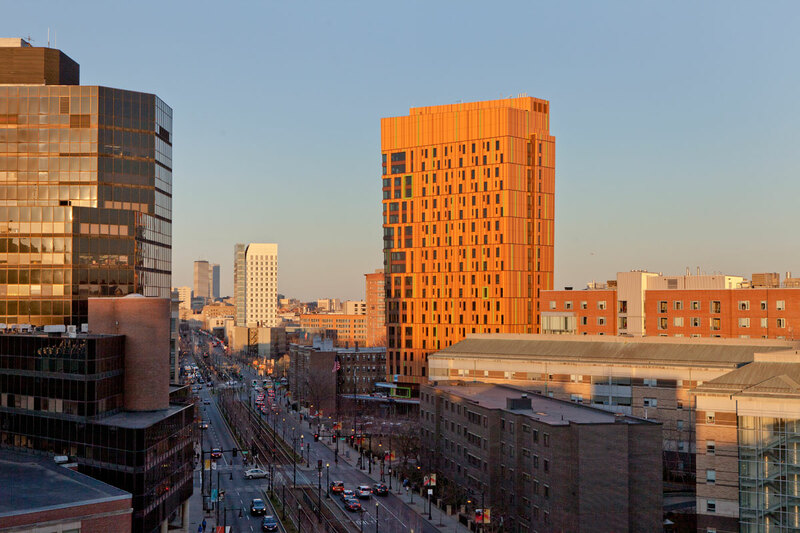 “We started with dark colors at the bottom that lighten at the top, making the building seem to disappear into the mist,” said Tamara Roy, AIA, LEED AP, senior associate principal, ADD, Inc., who served as design leader on the MassArt Residence Hall project. The Alucobond panels “change color from the trunk of the tree into the canopy,” added Boley, who said the panels were oriented vertically and set in a total of five different depths from the building to simulate a tree’s bark-like surface. Lymo Construction worked with project managers at general contractor Suffolk Construction Co., Inc., of Boston, to bring the project in under budget. (Total cost of the project was $61 million, including $52 million in construction costs, according to Roberts.) 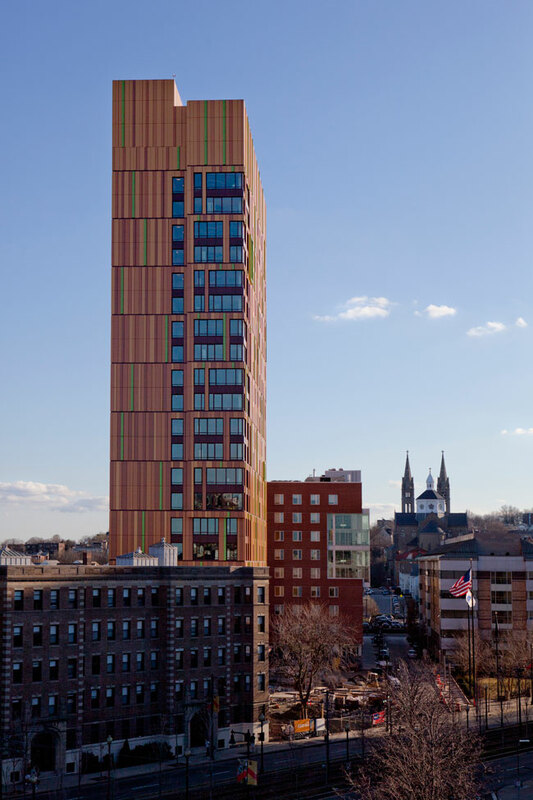 The Boston office of Simpson Gumpertz & Heger (SGH) provided engineering support for the building envelope. Lymo was able to fabricate the majority of Alucobond panels from theoretical dimensions approximately four months in advance of their installation on the construction site, according to Lynch, who said panel installation began in June 2011, with the majority of the tower completed in January 2012. 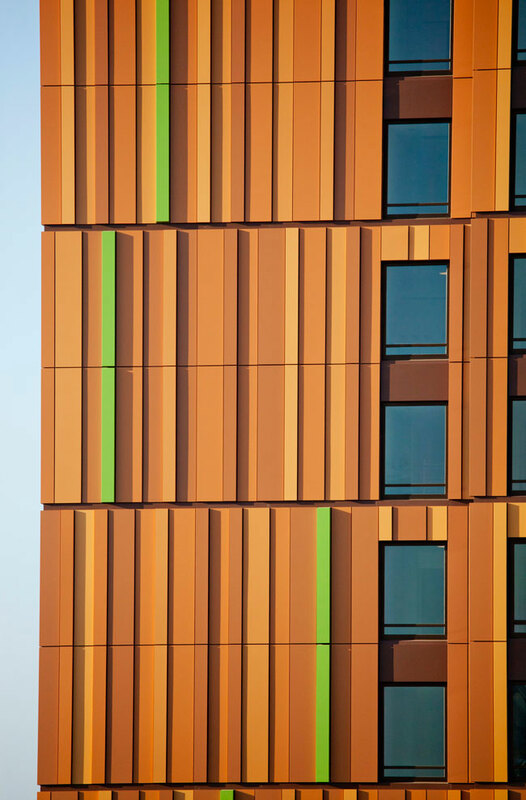 In addition to the seven custom colors and five gloss levels, the Alucobond panels were fabricated in varying widths ranging from 8 inches to 3.5 feet. Even with the best logistics, the installation of so many different panel options still resulted in the need to change a few panel placements.